"Tambayan Sa Kanto," the trending resto-bar located at the ground floor of The Podium, Ortigas Center, Pasig City which is serving an "Eat-All-You-Can" all-Filipino Cuisines is also offering an "Acoustic Nights" shows during Friday and Saturday nights. 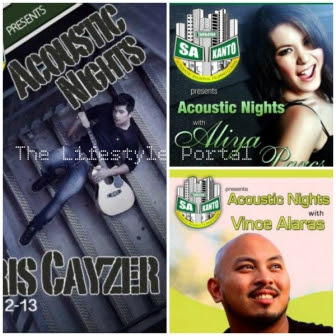 "Acoustic Nights" feature different artists performing different genres of acoustic music. The show starts at 9pm and ends at 2am giving the audience a relaxing and inspiring experience while enjoying the good foods. The International Heartthrob Chris Cayzer started the trend. He shared his acoustic versions of different love songs combining the 80's and the 2000's love songs. It was a back-to-back "Acoustic Nights" which took place last April 12 and 13, 2013. 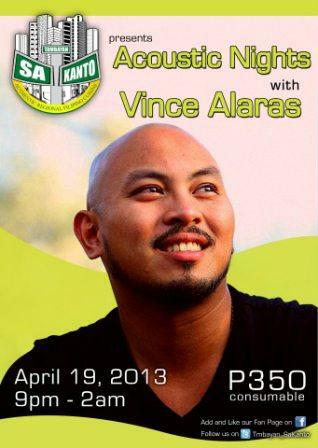 This Friday night of April 19, 2013, the former South Border member Vince Alaras will take you to his music as he takes the center stage of the second week of "Acoustic Nights." Reminisce the good songs popularized by his band together with the other classic love songs with him performing. Then this Saturday night, April 20, 2013, the acoustic princess Aliyah Parcs will serenade you with her soulful voice. Yup, she is the first acoustic female singer joining the artists of "Acoustic Nights." 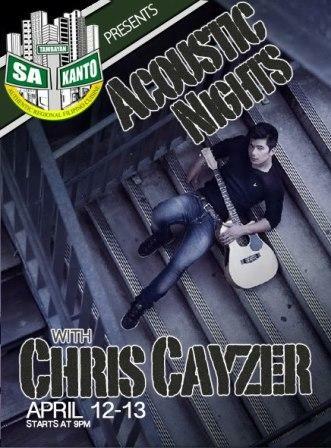 Next week on the Friday night, April 26, 2013, get ready for the comeback of the heartthrob and the Australian X-Factor finalist Chris Cayzer in Tambayan performing his third gig in this cool resto bar. He will perform three sets of acoustic love songs. Each set is composed of 10 songs performed by this very own rock and acoustic singer! And of course on Saturday, April 27, 2013, another artist will make his first gig here in Tambayan. He is no other than Janjay Coquila who will let you experience his very own renditions of the different acoustic hits!